Maybe you have a baby on the way, or maybe your little one is finally ready for their own room, but it’s time for a nursery makeover! Decorating a nursery is a fun but sometimes daunting task, but doing something as simple as painting the walls can really liven up the space and add a bit of personality. 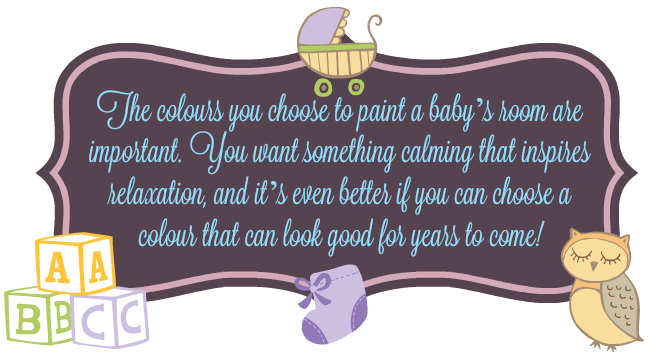 Here are my top 5 tips for painting a nursery! Deep, matte walls might be chic and sophisticated for an adult’s bedroom, but when you’re painting an area prone to spills, drawings, and any number of adorable but destructive things, a paint with glossier coverage is best, as it’s easier to clean. Make sure you choose a paint with low/no VOC, or Volatile Organic Compounds, as these aren’t safe for babies or young children to be around. If you’ve fallen in love with a colour that contains VOCs, ask someone at the paint store to colour match it for you. If you’re strapped for time when decorating your baby’s room, why not try an accent wall rather than painting the whole room? This not only saves time, but it's also more cost effective, and will add visual interest to your plain white walls. You can even find patterned paint rollers, which add a beautiful touch to your walls without having to add coat upon coat of paint. And if you’ve been putting off painting and now the baby’s almost here, there’s no shame in hiring a professional to do it for you. Hiring a local painter not only stops you from being on your feet as much, but puts more time in your hands to get other things done! The colours you choose to paint a baby’s room are important. You want something calming that inspires relaxation, and it’s even better if you can choose a colour that can look good for years to come! You might be into super bright reds or oranges, but try to use those colours as accents rather than to paint the entire room. Calming colours like greens and blues are nice choices for a nursery, and neutrals like beige or grey are great, although white can be a bit too blinding, and isn’t very stain-proof. If you don’t want to give up on the brights, try painting the walls grey and adding a bright pattern to them instead! Instead of painting patterns on your wall, inspire learning by painting their name, the alphabet, or even things like the solar system! If you’re feeling daring and have a lot of time on your hands, you could even paint the nursery in a wildlife theme and include animals! You may be super into modern, sleek, neutral style; but don’t be afraid to have fun with your child’s nursery! Babies love visual interest, and it helps stimulate their growing minds, so don’t be afraid of patterns, prints, or texture. I hope you enjoy creating a beautiful and fun space for your child to grow, and that these tips have helped you with the great task of painting a nursery.